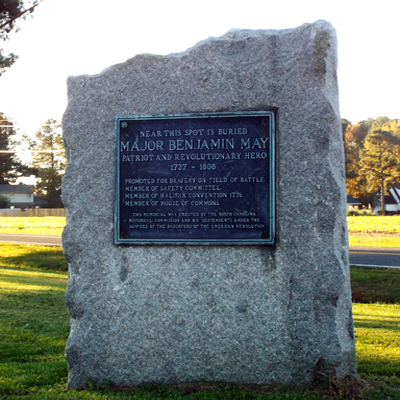 A massive block of granite is dedicated to the memory of Major Benjamin May, Revolutionary war hero. It is six feet tall at its highest and four feet wide. The granite is rough-hewn with straight sides and sloped top. The bronze plaque is thirty inches wide and twenty-four inches wide. NEAR THIS SPOT IS BURIED / MAJOR BENJAMIN MAY / PATRIOT AND REVOLUTIONARY WAR HERO / 1737 – 1808 / PROMOTED FOR BRAVERY ON FIELD OF BATTLE. / MEMBER OF SAFETY COMMITTEE. / MEMBER OF HALIFAX CONVENTION 1776. / MEMBER OF HOUSE OF COMMONS. 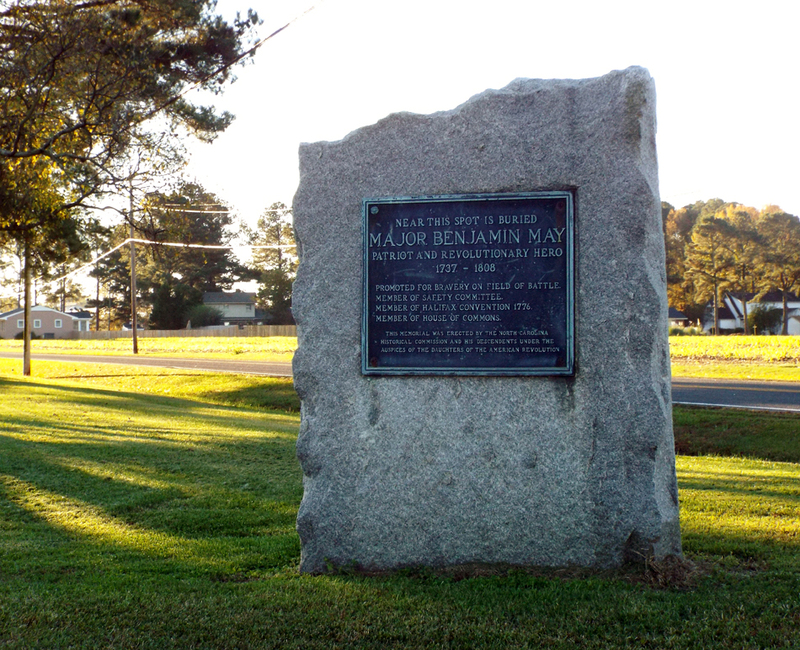 THIS MEMORIAL WAS ERECTED BY THE NORTH CAROLINA / HISTORICAL COMMISSION AND HIS DESCENDENTS UNDER THE / AUSPICES OF THE DAUGHTERS OF THE AMERICAN REVOLUTION. North Carolina Historical Commission, Daughters of the American Revolution and May descendants. The maker is located at the corner of West Church and West Wilson Streets in Farmville, NC. The granite slab sits at a street corner with farmland across West Church Street and scattered housing across West Wilson Street. Farmville United Methodist Church is across the same lot, 100 yards away.